Firestone Precision Sport tires feature an all-season and a high performance tread compound to give drivers improved handling and a smoother ride, whether it be on a wet or dry road surface. The tire itself sports a symmetric tread pattern with dual circumferential grooves to move more water out from under the tire on rain soaked roads. Wider shoulder blocks enhance cornering stability and steering response. Inside the tread you’ll find two steel belts that work together to provide more strength and a longer lasting tread life. 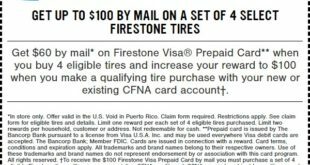 Prices on the Firestone Precision Sport range from around $65 for the 14 inch tire to approximately $120 for the larger 17 inch series. 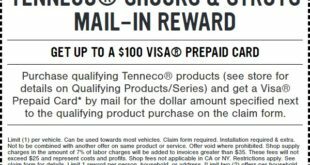 Below you can find printable coupon. 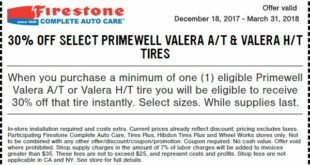 Other Firestone tire coupons are located here. 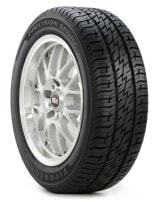 Who Are Firestone Precision Sport Tires Designed For? Firestone has designed the Precision Sport tire for drivers of various sport coupes and sedans who are looking not only for an all-season radial, but also a tire that has high performance characteristics to handle well on both wet and dry pavement. Firestone tires backs up the Precision Sport radial tire with a 5 year or 40,000 mile tread guarantee. A first 2/32 inch of wear for the tire’s uniformity is provided as well. 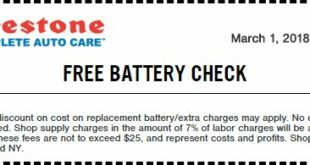 Materials and workmanship are backed for 5 years and come with a free tire replacement during the first 3 years. The remaining time period is prorated down until the final 2/32 inch of useable tread. 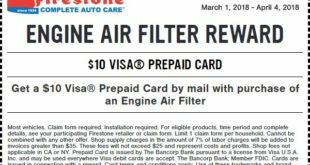 Firestone tires also included their 30 day buy it and try guarantee whereby you can refund or exchange the tires if you are not satisfied.